The discussion “Participatory democracy through systems thinking’ on the Systems Thinking in Action’ network on LinkedIn raises a number of issues that merit discussion. This applies even to the assumptions (taken for granted?) that Improved participatory democracy is desirable, and that Systems thinking is the best approach for achieving it. These assumptions may not be universally shared and at least some rationale for them might be addressed. The rationale or justification for these assumptions would have to address the expected efficiency or quality with which the tools of systems thinking (that still need to be determined; the discussion did not reach a clear consensus on this, and left the question whether ‘new’ ST tools would have to be developed to achieve the expected effect) would address the task in comparison with other approaches. These issues have to do with the criteria that determine ‘better participatory democracy’, as judged by whom, according to what method. The results of the evaluation would then, presumably, support a process of decisions, actions to be taken, by what agents and what methods. The discussion arguably did not explore all of these questions yet, nor establish a decisive agenda about how systems thinking people would or should go about the project of improving participatory democracy. (The issues, incidentally, apply both to the process of working towards the stated aim, as well as to the workings of the resulting democratic governance system.) The discussion did focus more on the need for such improvement; some posts even pointed at available systems approaches and tools that have been developed and applied but did not achieve a convincing consensus about their appropriateness. The issues raised and shown in the map below are not as trivial as they might seem (since they relate to matters describing any governance system). For example, is the assumption that systems thinkers – a species of experts presumably in possession of insights and skills not necessarily present in the average citizen – will be involved in many or most of the issues and decisions, itself somewhat at odds with the ‘democratic’ criterion that citizens rather than experts should have the determining say in those decision? The map should be seen as a first tentative step towards helping to clarify the agenda for such a process. 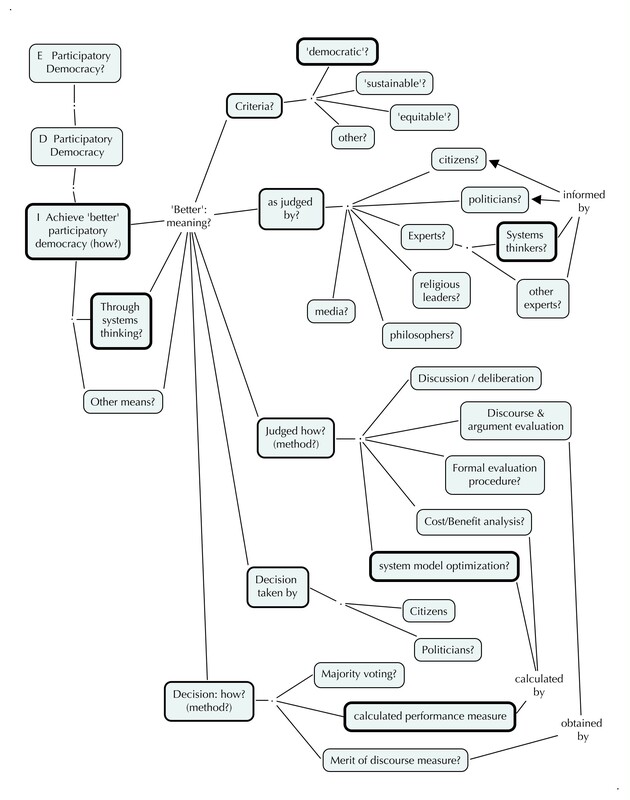 For each of the ‘end’ nodes of the map, further issues about whether the particular option should be chosen (deontic issues) and if so, how (by what means) the specific choice might be achieved and implemented (instrumental issues). One of the main advantages of systems models, the identification of the various conditions (context variables, parameters) under which interventions would be expected to perform, has not been adequately explored by the discussion this far. Unfortunately, the LinkedIn format does not accommodate visual material such as diagrams of the systems components and relationships; the necessity to divert participants to other sites for such material has been (as usual) a main obstacle to the systemic exploration of the topic. The map shown below is still mostly a ‘topic’ map; only at the first level are different individual issues (deontic, instrumental, explanatory for the same topic) identified. More detailed ‘issue maps’ will have to be drawn for each of the main topics of this map.